"On the train, you get to know people. On the train, kids wave at you, and you wave back. Tracks stitch places together; freeways tear them apart." 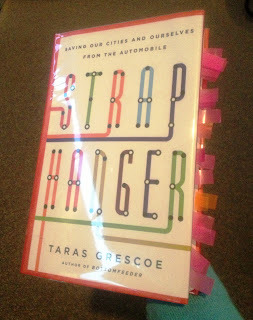 Taras Grescoe's Straphanger: Saving Our Cities and Ourselves from the Automobile has had a profound impact on the way I think about my car. See all those Post-It flags? Each one was "something very interesting." I've never been especially enamored with owning/ maintaining/ driving a car. It's a nuisance, mostly. I've chosen to live in Maine, but in arguably the most densely-populated neighborhoods in the state. Despite that, there aren't a lot of truly great alternatives to a car. But Grescoe has convinced me that it doesn't have to be this way. 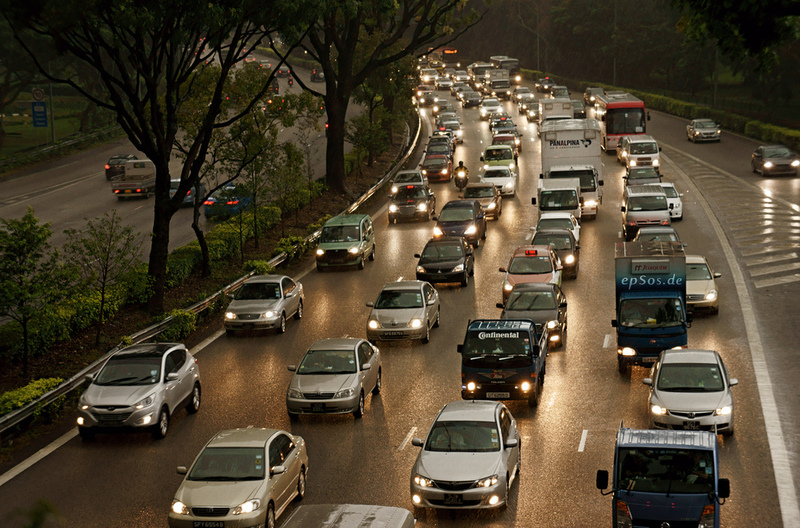 The reasons why Americans seems hopelessly car-dependent? Part public policy, a dash of cultural influence and mythology, and a whole heap of business deals and urban planning and development. There was a time, before there was "a chicken in every pot and a car in every garage," when you could ride the inter-urban trolleys from Waterville to Sheboygan (p. 55). Cities consisted of a walkable urban center with "streetcar suburbs" radiating out from the middle (think Portland Peninsula, with South Portland, Deering and North Deering, Rosemont, etc., just a streetcar ride away). Then a variety of factors created and accelerated a perfect storm after the 1920s. "'The twentieth century was a horrible detour in the evolution of the human habitat. We were building more for cars' mobility than children's happiness.'" - Enrique Peñalosa (p. 208) The rise of the automobile transformed pedestrians into "jaywalkers." For the first time in human history, PEOPLE were secondary; CARS held (and continue to hold) primacy. Cultural leaders denigrated mass transit users; the word "straphanger" denotes someone who relies on public transportation, and in the 20th century, it was especially unflattering: "Any man of forty who still rides the metro is a loser," said Salvador Dali. Enter Suburbia 2.0 (p. 91): exacerbated by the extreme demand for single-family homes after WWII. Eisenhower's delight in the Autobahn led to our Interstate system; urban planners like Robert Moses razed traditional neighborhoods in favor of parkways, freeways, and "arterials" (think Franklin Arterial running like a scar through the middle of Portland). Seismic changes in society placed the nuclear family above the extended family or neighborhood. 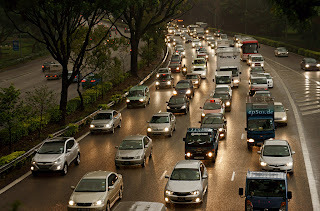 People moved away from the cities, freeways hurried people inside their cars, in, out, and around cities and suburbs. Chicken or egg, egg or chicken. Either way, whether we like it or not, most Americans are strapped in their cars, for increasingly long and terrible commutes, with a higher price tag. Today, "car-dependent" American households spend 25% of their income on transportation (p. 37). Furthermore, it seems to me that American housing and development has been urged along in support of our strange all animals are equal, but some animals are more equal than others society. Brits and Japanese use excellent mass transit, and live reasonably happily in close quarters. Says Noboru Harata of University of Tokyo, "to use public transport is to know how to cooperate with other people, how to behave in public space." Conversely, Americans insist they need to spread out, often engaging in perverse incivility on the road - honking, rude gesturing, or full-on road rage. American-style zoning reinforces socio-economic, ethnic and racial bias, and regardless of whether you are an executive, or the maid that comes to clean the executive's house, nearly everyone LIVES far from where they WORK! According to Frank Lloyd Wright (and Thomas Jefferson), "redistributing the population in bucolic surroundings could resolve all social problems" (p. 98), but we know now that they don't. In fact, I think this insular living (complete with country clubs, gated communities, "55 Plus" communities, even garden-variety homeowners' associations)encourages the divisive politics in this country - red vs. blue, country vs. city. I think we backed the wrong horse. According to a 2009 Pew Research Center survey, "only a quarter of Americans say suburbs are their ideal community type. A clear majority say they'd prefer to live in a small town or a rural area; the rest say the'd most like to live in a city. In other words, while surburbia is where most people have ended up, it's not necessarily where they want to be" (p. 84). And according to Kenneth Jackson, "the prevailing myth is that the postwar suburbs blossomed because of the preference of consumers who made free choices in an open environment. Actually... most postwar families were not free to choose among several residential alternatives. Because of public policies favoring the suburbs, only one possibility was economically feasible" (p.91). We were sold a bill of goods - that a single family home on an acre is the "American Dream," that owning is always wise, and renting is always foolish, or at least second-rate, and that once you have kids you HAVE to have a car, or two, or even three. Suburbia 3.0 was the McMansions of the late 20th century. Why not move 30 or 40 miles away from the office park, and live in a 4,000 square foot house and acreage to boot when gas is 89 cents a gallon! Margaret Thatcher made her opinion abundantly clear when she said that "a man who, beyond the age of twenty-six, finds himself on a bus can count himself as a failure" (p. 7) OUCH. But today it's version 4.0, and it just isn't working. Families have walked away from their homes (and mortgages) in heavily suburbanized places like Las Vegas and Phoenix: in 2011, nearly100,000 Phoenix houses were vacant (p. 87). "The ideology of growth for growth's sake has reached its limits. When it comes to houses and cities, bigger is not better. Bigger is more McMansions; bigger is subdivisions so sprawled people never get to know their neighbors; bigger is ever longer, ever more soul-sucking commutes. Bigger is stupider [emphasis the author's]" (p. 292). 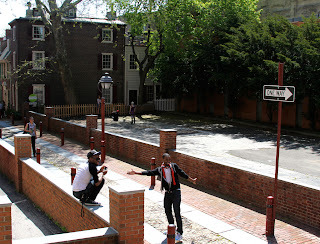 "Every time you choose to drive you are, in a tiny way, opting out of, and thus diminishing, the public realm. And that, finally, is the problem with suburbs and freeways. In order to gain a spurious freedom, which is in fact just increased mobility, millions of people turn their backs on civility - not just politeness, but also the process of civilization building, in which cities play such a crucial role. Sprawl may end in cul-de-sacs and foreclosures, but begins every time you slam a car door on the world" (p.99). So what do we do? Change is possible. But it's not just policy, it's cultural, and we need to adjust our expectations. That isn't diminishing quality-of-life. Just the opposite. 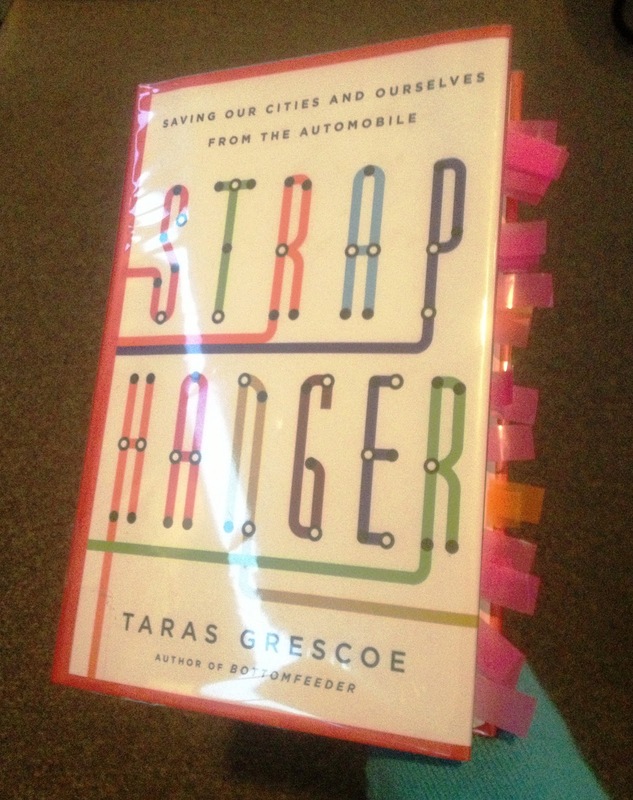 Taras Grescoe is starting by reinventing the very word "straphanger," not as a derisive one but as one of pride in personal intent. 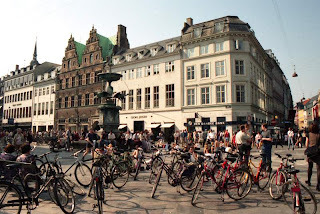 Copenhagen is "the world's first post-automobile city" (p. 157) a model city for how widespread bicycle use as the primary mode of transportation CAN happen. Only 40% of the households of Copenhagen own a car. Instead, streets and roads are structured to be considerate of the special circumstances of bicycles. Families load their kids into cargo bikes, people of every age, people on their way to the office, even the elderly ride bicycles to get around! In Moscow, "straphangers" flee the disastrous gridlock topside and instead ride the elegant, artful, and warm subway system. In just 10 years, Bogotá, Colombia has gone from being one of the most decayed places in the Americas to a liveable city... thanks largely to a high-quality bus system and public policy that supports bus "rights-of-way," giving them "rubber rails," effectually treating them like streetcars or trains rather than another vehicle miserably boxed in by traffic. Janette Sadik-Khan is revolutionizing bicycle transportation in New York City. Cars are desperately unfashionable among Japanese youth. Christopher Alvarado (@Avogadro), a Cleveland urban planner since 1994, is an expert on bicycle, pedestrian, and sustainability policies (and a close friend of mine from college). Have a listen to his recent interview on The Outspoken Cyclist (his interview starts at 38:00 into the podcast). He's one of the founders of Bike Cleveland, the advocacy organization for cyclists in Cuyahoga and the surrounding Northeast Ohio counties, viewing bicycling as an integral part of "placemaking," building liveable and healthy, resilient communities. Bike Cleveland isn't about spandex, or the number of cyclists, but the importance of walkability, bikeability, and supporting dense neighborhood development. Alvarado is a Fellow with Strong Cities, Strong Communities, a White House effort focusing on urban issues, especially how best to provide services in "legacy" cities as well as extend them beyond the city proper. This program helps to develop leaders in cities and create "solutions teams" bringing people together from, say, the EPA, Army Corps of Engineers, HUD, etc - agencies that don't typically work together - because all of these departments deal with urban challenges and sharing information among them can create better results. He believes strongly in "densifying" neighborhoods to increase walkability WHILE ALSO creating green space, including public garden space. Cleveland is redeveloping itself right now, with more than 11,000 lots available from the city for about $100 a lot (yes, that's right, $100.00). It's THAT important that urban neighborhoods be dense so that transit can be successful. 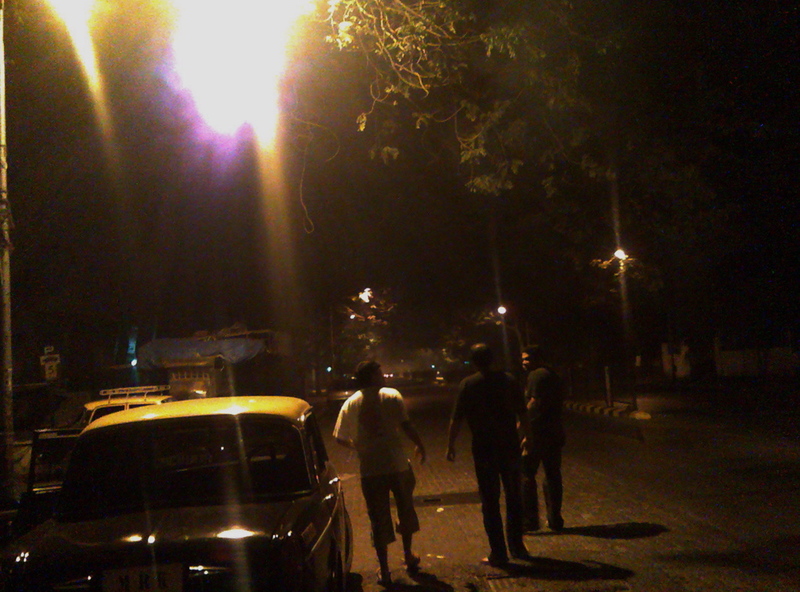 Why will people come back to the city? Chris absolutely echoes the sentiments of many of the cited sources in Straphanger, especially that tax incentives and Dept of Transportation funding have funneled Americans straight out to the suburbs. He also says Millenials are less interested in an automobile lifestyle and would much rather walk to work or socialize (personally, I think that Millenials are the first generation in 100 years who really don't want to drink & drive, so living walkably - or stumble-ably - is a better alternative on any given Saturday night). People who are older may not WANT (been there, done that!) or be able to drive anymore. I know, I'm an idealist, and I still think reducing car dependence is worth pursuing. Portland has the "good bones" of the bigger Eastern cities - Boston, Philadelphia, New York, and Washington, where mass transit is working. We can find it again; it's still there, just as the antique streetcar rails are still embedded in Cottage Road (I saw them this summer when they ripped up the asphalt for repairs at Legion Square). Amtrak Downeaster is doing so well they've revived service to Freeport and Brunswick (after a 50-year hiatus!). And as much as soccer moms feel the need for the minivan, a community designed around car-free living is actually much healthier for children physically and emotionally. Car-free space means that children can play with less direct supervision because more community eyes are out and about, and people know one another. Jane Jacobs, who in the 1950s fought for (and won) the battle to save Manhattan neighborhoods, "pinpointed the appeal of such neighborhoods such as Boston's North End and her own Greenwich Village, arguing that it was the disorderly vestiges of nineteenth century street life - shops and residents cheek by jowl, with the bartender sweeping his sidewalk keeping an eye on the neighbor's kids playing hopscotch - that made them safe and viable urban spaces.... dense neighborhoods function better when people rely on bikes, transit, and their feet" (p. 43). Enrique Peñalosa, one of the planners behind Bogotá's "TransMilenio" system, says "'I believe a city is more civilized not when it has highways but when a child on a tricycle is able to move about everywhere with ease and safety" (p. 218). That's a fare I'm willing to pay.